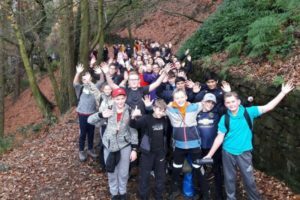 On Tuesday the 13th November Y8 travelled to Rivington Pike to complete a sponsored walk. The theme behind the enrichment day was volunteering ourselves to help others. Every form has spent time researching various local charities that they would like to sponsor with all six forms choosing charities very close to their hearts. Pupils will now collect their sponsor money ready to invite a co-coordinator for each charity to be invited into school. A fantastic day was had by all.